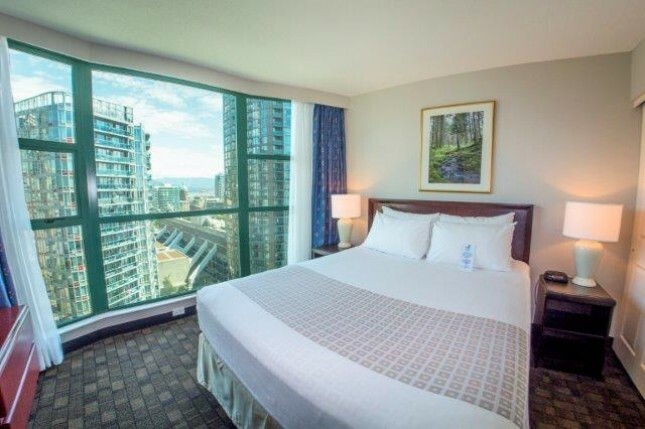 One Bedroom Suite features a King bed and floor to ceiling windows in the bedroom and a sofa-bed in the separate living room. Galley kitchen includes: three-burner stove, oven, fridge, microwave, and coffee-maker. One Bedroom Suite features two double beds and floor to ceiling windows in the bedroom and a sofa-bed in the separate living room. Galley kitchen includes: three-burner stove, oven, fridge, microwave, and coffee-maker. 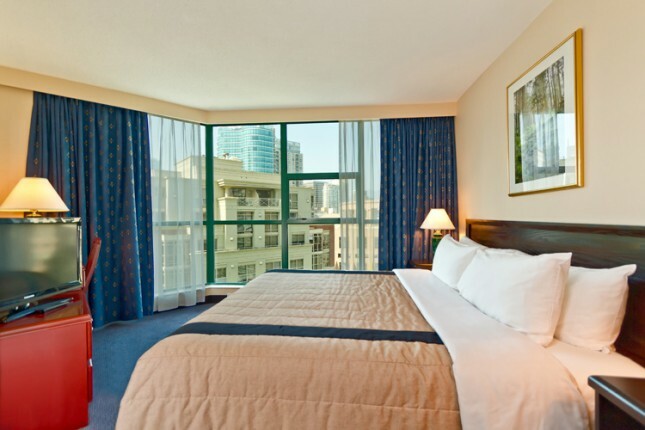 Deluxe Corner Queen Suites not only feature floor to ceiling windows in the bedroom, but also in the spacious living room. Galley kitchen includes: three-burner stove, oven, fridge, microwave, and coffee-maker. 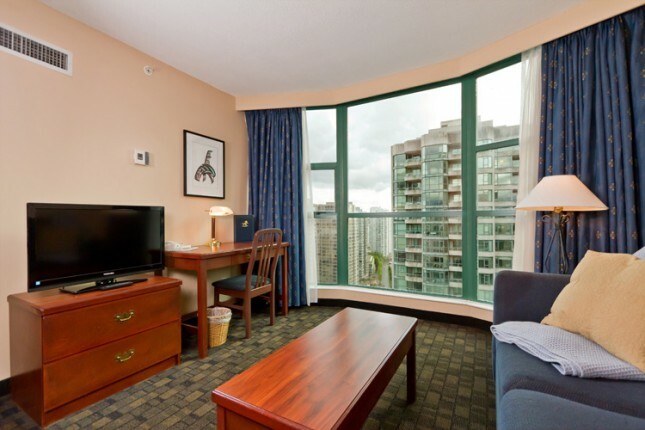 Superior Suites are located on the higher floors, feature upgraded amenities, flat screen televisions in both living room and bedroom. 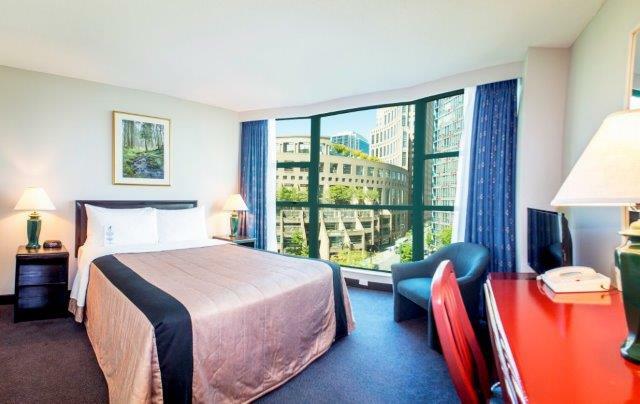 Bedrooms have floor to ceiling windows and a separate living room. Galley kitchen includes: three-burner stove, oven, fridge, microwave, and coffee-maker. Ideal suite for a family! 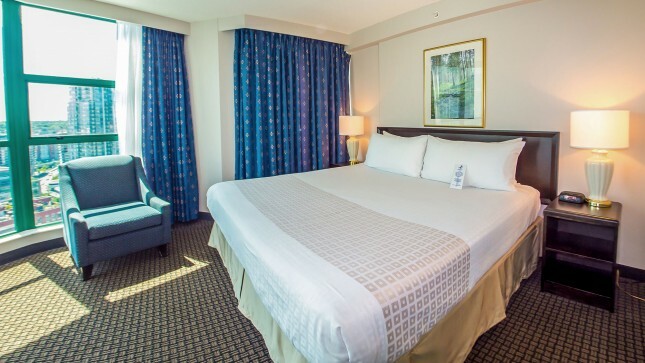 First bedroom features a queen bed, second bedroom has two twin beds. 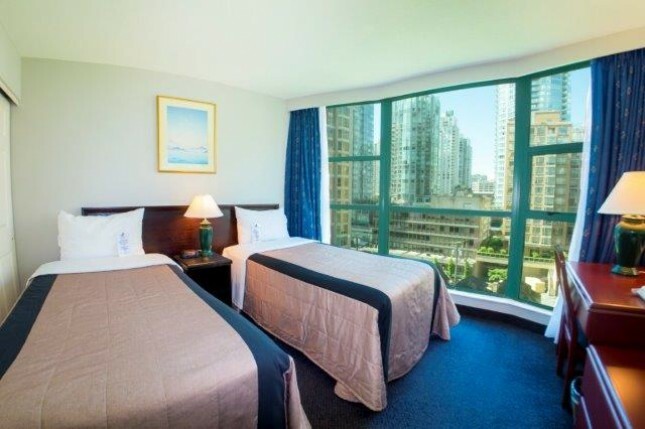 Both bedrooms have floor to ceiling windows. Separate living room with sofa-bed, and galley kitchen includes: three-burner stove, oven, fridge, microwave, and coffee-maker. 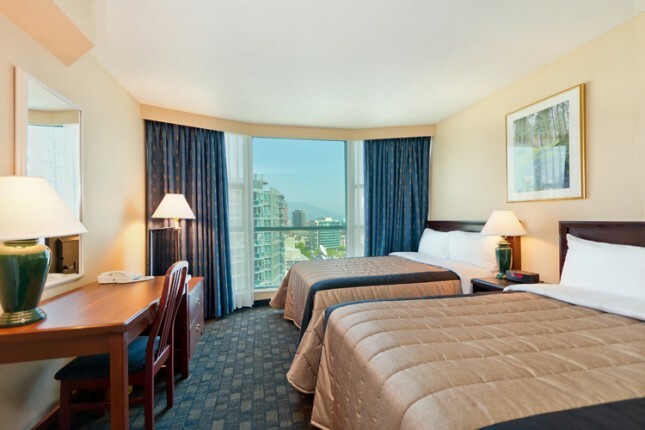 Two Bedroom Suite has queen beds and floor to ceiling windows in each bedroom, and separate living room. Galley kitchen includes: three-burner stove, oven, fridge, microwave, and coffee-maker. 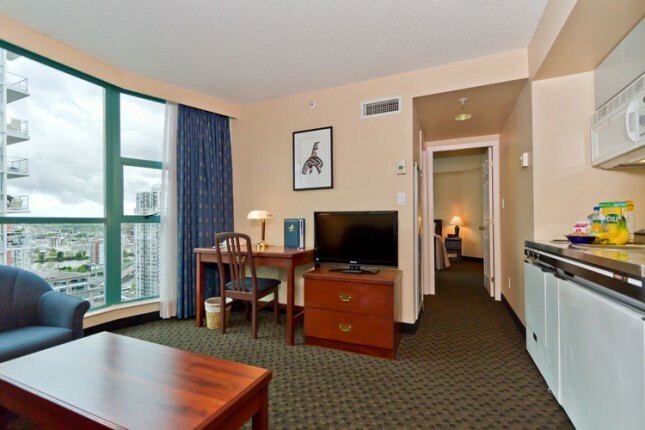 Our Superior Suites are located on the higher floors and feature upgraded amenities and flat screen televisions in both the bedroom and the living room. 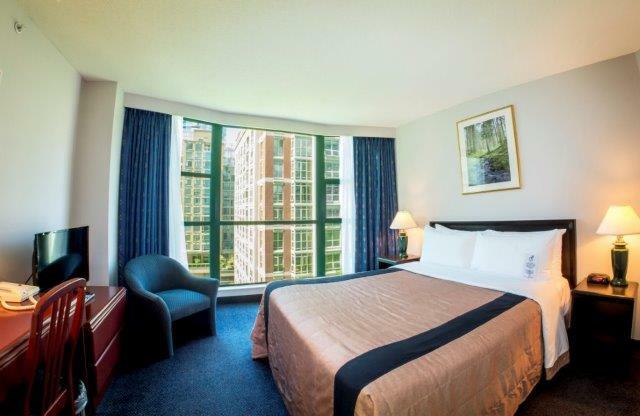 Each of the two bedrooms has one queen bed and floor-to-ceiling windows. Also features a fully-equipped galley kitchen. There is no sofabed in the separate living room. 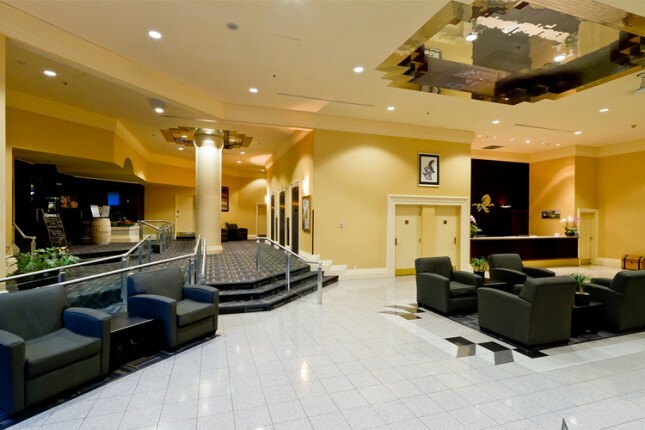 Garden Level Suites are located on the 2nd floor. 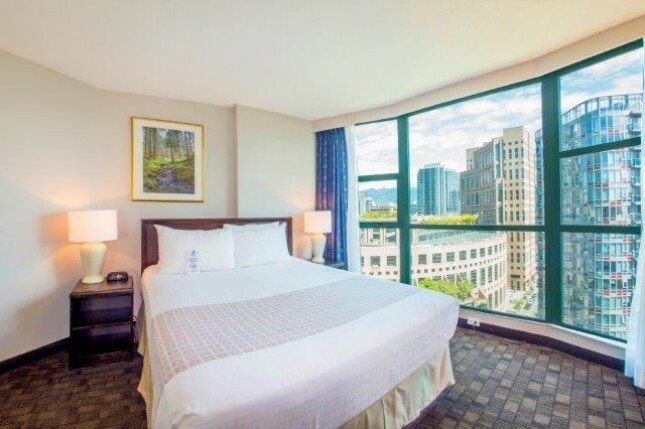 Bedrooms have floor to ceiling windows and a separate living room. Galley kitchen includes: three-burner stove, oven, fridge, microwave, and coffee-maker. 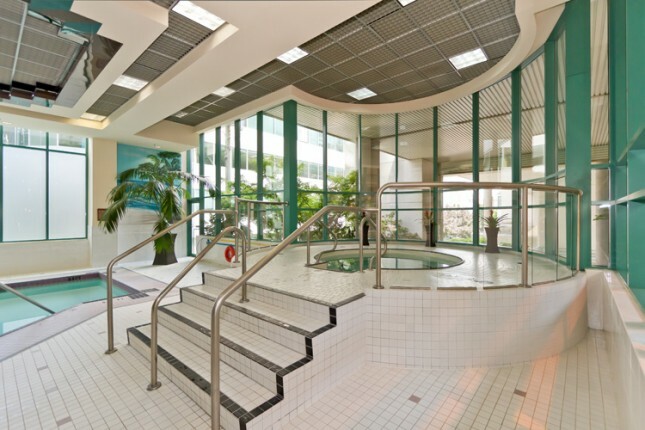 Garden Level Queen are located on the 2nd floor. Bedrooms have floor to ceiling windows and a separate living room. 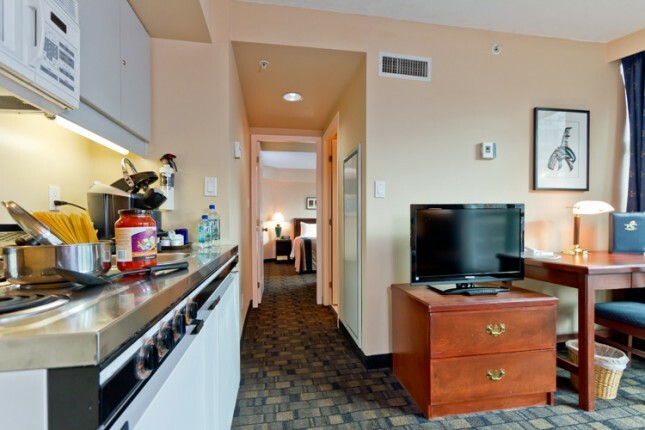 Galley kitchen includes: three-burner stove, oven, fridge, microwave, and coffee-maker. 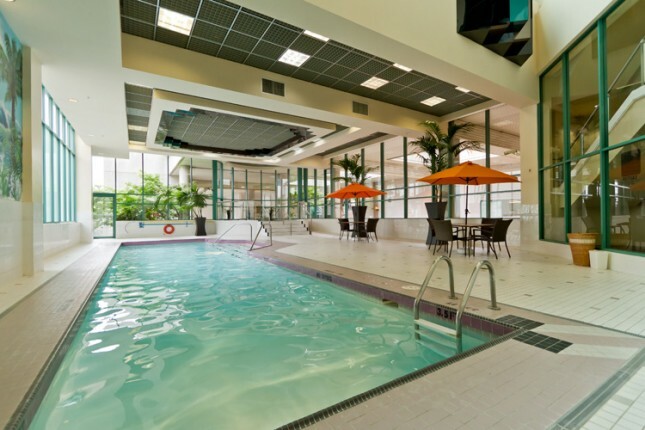 We are a favourite home away from home for sports fans. 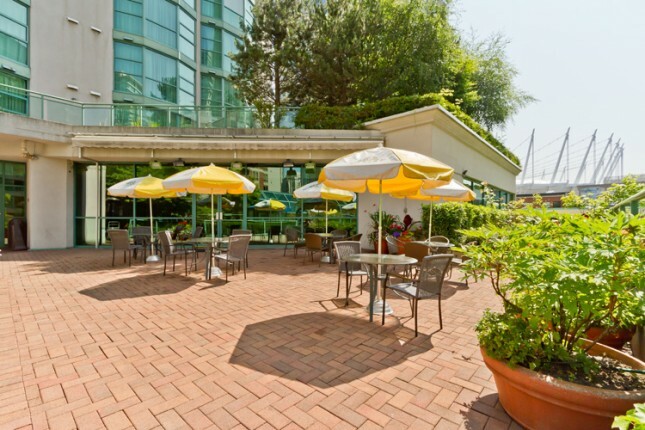 Just two blocks from BC Place Stadium, home of the BC Lions and Vancouver Whitecaps, and three blocks from Rogers Arena, home of the Vancouver Canucks, make the Rosedale an ideal spot for a sports-lovers getaway. 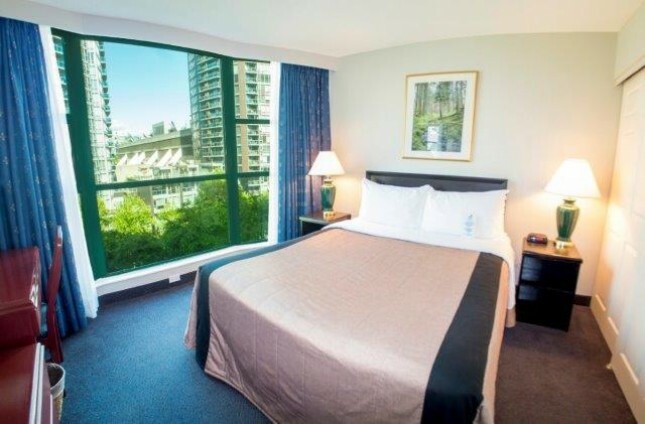 We are within walking distance to the Queen Elizabeth Theatre, the Granville Entertainment District, Chinatown, Gastown, Yaletown, Granville Island and of course, world-famous Robson Street. 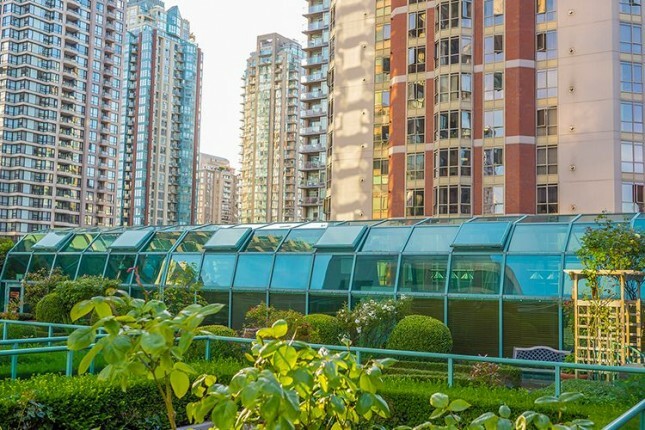 The Rosedale on Robson Suite Hotel provides a great selection of meeting rooms, suites and outdoor patios that are ideal for small to mid-sized corporate and social events. Explore and enjoy our vibrant city. 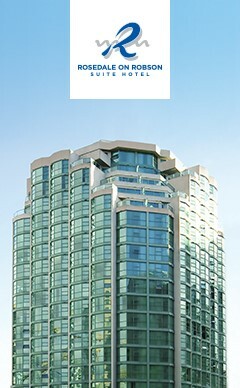 The best of Vancouver is at your doorstep. Major Credit card required as guarantee at time of reservation. The hotel is unable to process Visa Debit or MasterCard Debit Cards to guarantee a reservation, or as a method of payments. Cash not accepted as a deposit. 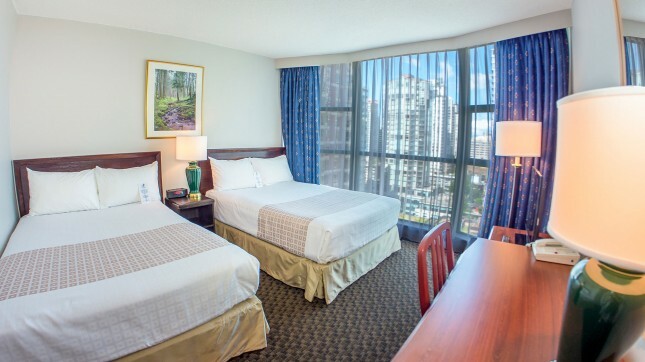 All reservations must be cancelled by 4:00 PM at least 1 day prior to arrival date, in order to avoid a no show charge equal to 1 night's room rate, and applicable taxes. HAVE A QUESTION ABOUT YOUR RESERVATION?